Did you know? Peeling skin of the potato will reduce the 60 percent of its potassium content as it lies so close to the skin. So to get the full benefits of the soothing potato, cook and eat with skin. 1) In a mixing bowl, add wheat flour, salt. Make a dough by adding water little at a time. 1) Preassure cook the potatoes and once cooked, mash them well using your hand/masher(with or without skin). 2) Heat oil in a pan and add cumin seeds. Allow it to splutter. 3) Add mashed potaoes, red chilli powder, turmeric powder and salt. 4) Add finely chopped coriander leaves and stir well. 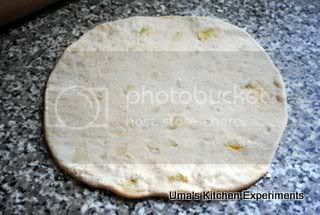 5) Make sure the stuffing is dry to make parathas. 1) Divide the dough into equal sized balls. 2) According to the count of the dough ball, divide the stuffing into balls. 3) Take one dough ball and dust it using wheat flour. Roll it to a small round size and in center keep one stuffing ball. 4) Using the corners of the dough cover the stuffing ball. 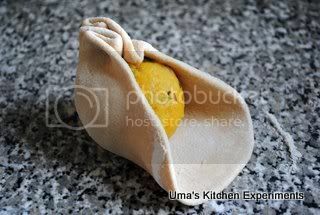 5) Gently press the stuffed dough ball using your palm/fingure as in picture. 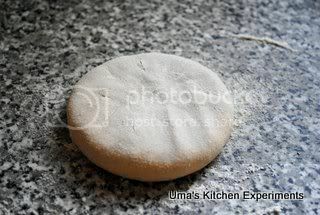 6) Using the rolling pin, roll it to round shape as in pic. 7) Repeat the steps for other dough and stuffing balls to make parathas. 8) Heat a skillet/tawa and coat the surface with butter. 9) Put a paratha and cook it. when the bottom side is cooked, turn it to cook other side. 10) In between, if required, add butter. 11) Repeat the procedure for remaining parathas. 12) Serve hot with curd/yougurt and pickle. 1) For the stuffing you can add green chillies instead of red chilli powder and if doing, add 1/2 teaspoon of lime juice or amchur powder to get proper taste. 2) You can also add garam masala if you like. Delicious parathas.. I always love this the most..lovely presentation too!! Paratha is my next post too.... Your pics are awesome.. especially step by step one!! delicious n healthy breakfast..hit with kids to adults...first time here..loved ur space n happy to follow u..
what a beautiful looking dish- loveddddddd it uma !can I have a parcel please ? Perfectly shape and looks so yum! Delicious looking one Uma, lovely click. I really love the way you photograph. Oh my..these look fantastic!!! SOft parathas with a flavorful & simple filling :) An all time fav paratha!! Hot parathas fresh from the kitchen so very delicious. Aloo Parathas luk perfectly tempting dear.Neatly done and deliciously yumm click as well.Luv it dear. Sorry came late to file my appreciation. 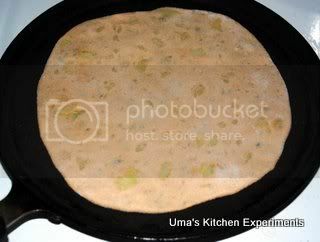 Parathas look yummy...Had tried making these twice.. but it never came out perfect... hopefully with your step by step pictures i will finally learn to make them properly..
perfectly made parathas !! great clicks !! Perfect and delicious looking parathas. 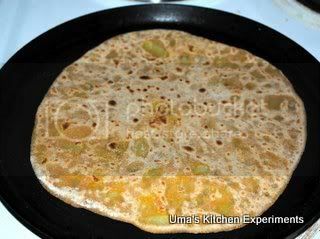 Paratha looks yummy and delicious,well explained with pictures.